2 BAÑOS COMPLETOS CON BAÑERA Y DUCHA HIDROMASAJE. ALOJAMIENTO DE LUJO EN MAGNIFICO CHALET INDIVIDUAL CON PISCINA PARTICULAR. A MENOS DE 200 METROS DE LA PLAYA. LA PLAYA DE MUCHAVISTA O PLAYA SAN JUAN ES UNA PLAYA DE 7 KM DE LARGO DE FINA ARENA RUBIA. La verdad es que las fotografías no le hacen justicia a la propiedad. Es super espaciosa, el área de la piscina/barbacoa es espectacular (de hecho, prácticamente toda nuestra estadía hicimos vida en esa área), muy cerca de la playa, y con facilidad de acceso a supermercados. Me habría gustado que el área de la piscina tuviera un poco mas de iluminación, pero en general, nos hemos pasado unas vacaciones geniales en el sitio. Atención espectacular por parte de los propietarios, que nunca dudaron en atender nuestras dudas, y siempre estuvieron atentos. Totalmente recomendado. Nos agrada muchísimo que hayáis tenido unas excelentes vacaciones. Muchas gracias por conservar, cuidar y limpiar la casa . Ha sido un placer teneros como inquilinos. Aquí seguiremos para vuestras futuras vacaciones. We were three generationer. All got on fantastically well here. A wonderful pool and an outdoor kitchen with lots of seating. We lacked a little spice in the kitchen and tea towels . If you thought at work with the computer or read and answer their email , so this does not work . Wifi was available but we could not even read their mail . Thank you for your opinion. When I saw it I changed the company. Now the wifi is perfect. We had a lovely time at this Villa - it was spacious and clean with a beautiful garden and BBQ area. The gated swimming pool was great and allowed us a family to relax with our 2 year old Grandson, all in all we couldn't fault it. Finally, I must add what a lovely family the owners are, nothing was too much trouble for them from the initial booking to saying goodbye - they were so helpful and kind. I would definitely return and most certainly recommend this Villa. It has been a pleasure to have in our home we hope to see you again. We stayed at this villa as family of 6, 4 adults and 2 children. The villa is great, well equipped, clean and large! The pool was a good size and kids loved the diving board. Only comment is that there could do with a couple more sun loungers as there was only 2. The outside cooking area was also an asset and we used the BBQ a couple of times. Villa is in a good location a short from the beach and access to tram which takes you to El Campello or Alicante. We have a fab holiday and wouldn't hesitate staying here again if we came to this area. Thank you for your rewiew, We are very happy because you enjoyed your holidays. This afternoon we bought two more chairs. We have just returned from a week at this villa and had a really great time! The owner Jesus was very helpful throughout the booking process and was happy to answer all of my queries pre arrival. His wife met us on arrival and showed us around the villa and how everything worked. The villa itself was extremely clean and well maintained. The outdoor kitchen area was great for eating outdoors even when we were unlucky enough to have a rainy day! The lockable gate to the pool was great at keeping our little boy out of the pool area without an adult. The villa also had plenty of inflatables and buckets and spades for the pool/beach. The villa is a short walk from bars, supermarket, a great butcher and baker and the beach. The centre of el Campello is just a short tram ride away on the most efficient and clean tram service! All in all we had a lovely holiday in a great villa and would definitely come again! We are pleased that you have had a great holiday in our house, we would love to see you again. Excellent Villa Great Stay ?We stayed at the villa for one week in September 2012. We have 2 year old triplets so we were naturally nervous about taking them abroad for the first time. Thankfully, the owner Jesus and his wife Matte were extremely helpful and even managed to provide us with 3 travel cost for our stay free of charge. 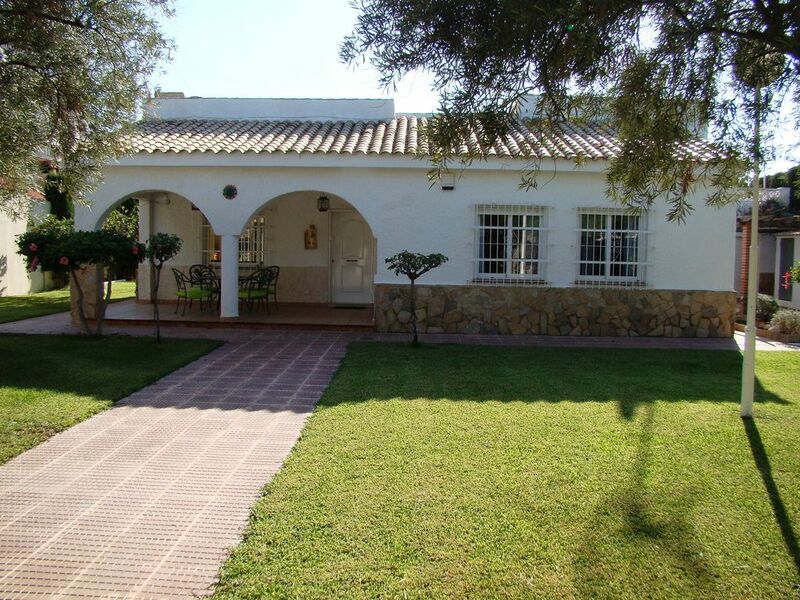 The villa itself is a large well decorated detached property set in a nice quiet area of San Juan and it is literally 2 minutes by car to the beach or a 10 minute walk. The property is set behind a tree lined fence on all sides and access is gained by either a lockable front gate or security gates with a keyfob which the owner provides. This was of great use to us as we could drive straight into the grounds and close the gates again behind us before the children got out of the car. The villa has 3 good size bedrooms (2 doubles and one twin) all with wardrobes, a huge living room, 2 very nice large bathrooms with power showers and a kitchen with oven, microwave, cups, plates, glasses etc. The owner also has cable TV, a Large flat screen, DVD and CD player in the living room. Outside the property is a huge well maintained garden with Olive and fig trees and a beautiful swimming pool which is surrounded by a small picket fence with a lockable gate - which is a great relief if like us you have small children. Next to the pool is a large barbecue area with table, chairs, sink and even an outside gas oven for cooking along with a CD player and an outside toilet. The beach at San Juan is amazing as is the beach at El Campello. We would recommend renting a car to explore the area as the beautiful Altea and the ?interesting? Benidorm are about 20 minutes away. We would recommend the restaurants at the seafront in El Campello where we ate every evening. Both San Juan and El Campello are holiday destinations more for Spanish people on vacation from places like Madrid so there is only a small amount of English tourists. As such the seafood in El Campello (which has its own harbour) is amazing and the prices are very reasonable. A 3 course meal for adults and 3 children?s meals with beer and wine was approx. 60 euros which is excellent value. In the UK a similar meal would be around ?100 easy. Anyway we had a brilliant time at the villa, the owners are great and we were back for just 2 days before we booked again for next year (2013) but this time for 2 weeks. AEROPUERTO DE ALICANTE A 20 MINUTOS. TODO ELLO EXCELENTEMENTE CONECTADO POR AUTOVIAS.